Greenwich Mean Time – What is it? Greenwich Mean Time (GMT) – What is it, and it’s importance to navigation. How did the international standard of time keeping, based on Greenwich Mean Time, come into being? Time is relative, as any student of the famous Einstein equation knows; but once, time was relative in a very practical sense. In ancient times, while there were means of measuring time such as water clocks, candle clocks and sundials, the majority of people lived their lives by sun, moon and the seasons. Time was a local matter that varied according to location on the planet – and that applied even when people believed the world was flat, or the sun went round the earth. The history of time begins in the 14th century when mechanical clocks became replacement timekeepers in religious houses previously regulated by bells. By the 16th century, the principles of knowing the time by clock and even wristwatch (keeping time) were well-established. This was also the period when European powers were setting out on voyages of global exploration. It’s at this point that the history of the international standardisation of time really begins, with the synchronisation of global journeys and time. Greenwich Mean Time, or GMT, is closely linked to the development and supremacy of the English, and later British Navy, and the need for sailors to know their precise location at any time while at sea. Without accurate clocks, it had always been difficult to find a precise location based on finding a geographic east-west co-ordinate, on the longitudinal lines running from pole to pole known as meridians. Latitudinal co-ordinates, running parallel to the equator, had been measurable for centuries using quadrants and astrolabes and the positions of the sun and Pole Star. Complex artefacts similar to the Greek Antikythera mechanism for measuring the movement of the planets and mapping the year had existed since ancient times. Identifying the longitudinal location of the vessel, however, remained problematic right into the 18th century, when the British government offered a large sum of money to anyone who could come up with a solution to the issue of finding longitude, which had previously mostly been identified by lunar eclipses. John Harrison was awarded some of the prize in 1773 for his marine chronometer, the culmination of decades of research. By this point, Greenwich was established both as the maritime and astronomical centre of Britain. Charles II had founded the Royal Observatory at Greenwich with the intention of resolving the issue of longitudinal accuracy for mariners. Astronomer Royal Nevil Maskelyne, developer of the lunar-distance method of discovering longitude, died in Greenwich in 1811. Greenwich thus became a point through which one of the longitudinal meridians (the 360 north-south divisions from pole to pole, 180 east, 180 west) was located. 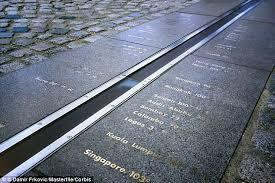 It was not a certainty that it would be the location of the Prime Meridian at 0 degrees though. That was only established by a Washington conference in 1884, after strong competition from Paris, making mean solar time at Greenwich the location of global time. This entry was posted in News and tagged gmt, greenwich mean time, prime meridian, time zones, universal time by Erica. Bookmark the permalink.